So we're nearly at the end of the first half term of our 'official' home education. To be honest, very little has changed for us as we have always enjoyed a wide variety of educational experiences. We do up to an hour of written work on most days using maths and literacy workbooks, but it's not all in one go. A couple of pages after breakfast before we go out, a couple more in the afternoon when we come home, and maybe a couple more after dinner. The workbooks probably aren't completely necessary as there is so much learning going on without them, writing labels on pictures, adding up scores in our magnetic fishing game, singing number songs and so on. For me though the books feel like a good way to add to our paper record of progress and both boys enjoy showing daddy what they have completed at the end of each day. Perhaps because they see both Matt and myself studying, doing what they call home school is just a normal thing for the boys. When I'm helping Ollie with a page from his maths book, Toby will sit next to us with his colouring book concentrating just as hard on that as Ollie does on the numbers. Yesterday Ollie was talking a bit loudly and Toby said 'Shh I doin my school work' as he sat drawing faces on his little whiteboard. Toby also likes collecting up the work books from the kitchen table and saying 'I put on Daddy's desk now, he look later'. What forms the backbone of our learning however, and the thing the boys most enjoy, is the outdoor learning. This can be learning about seasons and weather as they ride their scooters through the park, or something more focused such as a bug hunt. 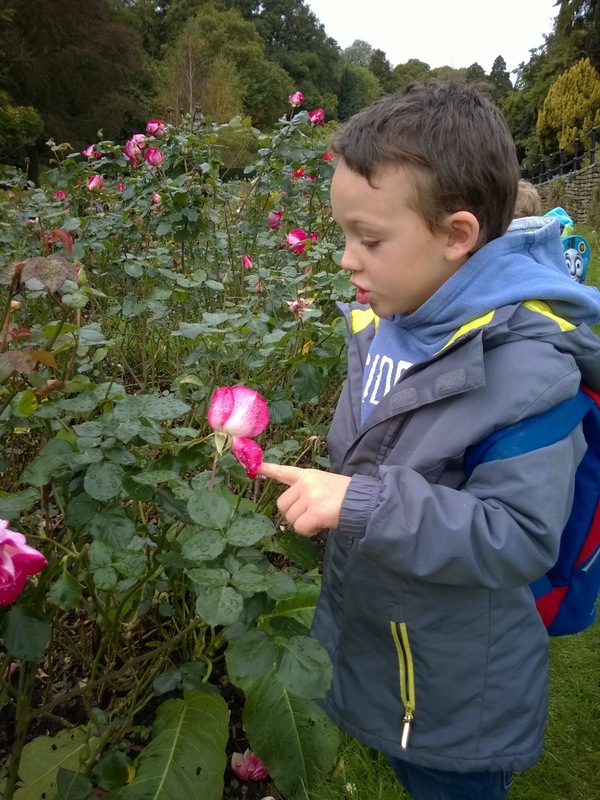 We are fortunate to have an amazing park a short drive away with all sorts of different habitats, lots of water ways, formal and informal flower beds and an amazing collection of trees which are often helpfully labelled. This week Ollie wanted to go searching for water boatmen after watching about them on an episode of 'Minibeast Adventure with Jess' on Cbeebies. 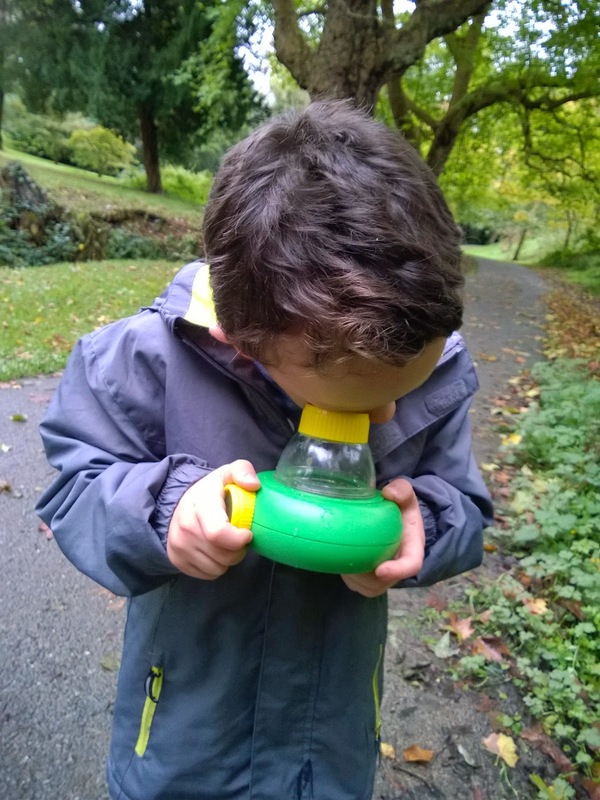 We headed off to the park with out nets, the plastic yoghurt buckets that we use for all sorts of things, and a bug viewer. On the way to the shallow muddy pond that I thought might be our best bet for finding some we did a lot of sensory exploration. I pointed out herbs such as rosemary for the boys to smell and try to name, we spend a long time in the rose garden looking at all the different colours and sizes of roses and running around to find our favourite colours and smells of roses, then wove in and out of the bamboos listening to the noise of it rustling and making up stories about panda bears. A heavy fall of sweet chestnuts provided an opportunity to investigate the prickly outside and soft inside of the cases, and peel some chestnuts, all of which had a little maggot munching away inside to the boys delighted interest. We looked at the difference between the leaves on the evergreens and the falling leaves of the deciduous trees. We talked about chlorophyll and why the leaves are changing colour. We compared leaf shapes of the different types of oak growing along the path, the sharp points of the Pin oak, the deep lobes of the Hungarian oak, the small compact lobed leaves of our own English oak. We compared sizes, lining up the leaves we had collected in order of size and hunting for the biggest and smallest leaves we could find. At the pond we gently scooped up some freshwater shrimp with our nets, watched them swimming around with the bug viewer and then released them. No water boatmen today, but perhaps it's getting too cold for them now. The 'pond' is more of a silty bottomed scrape in the earth at the side of the path, so not the best pond dipping place, but safer with little ones than hanging over the edge of one of the bigger ponds. 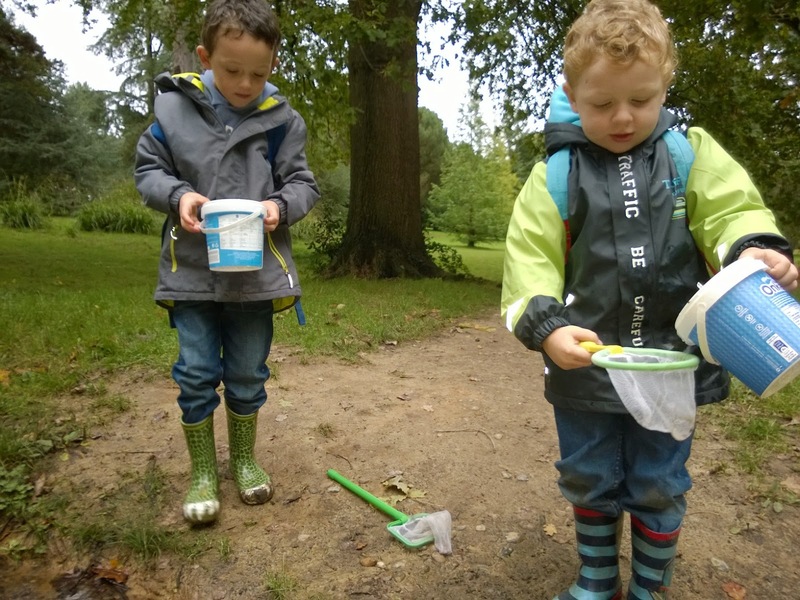 We then went to a place where a shallow stream pours across the path so the boys could play with their nets and buckets - no expectation of catching anything, but the action of repeatedly scooping up and pouring out water is one which the boys really enjoy. We talked about why the rivers in the park were flowing so swiftly today - about the heavy rainfall, catchment areas and valleys, the water cycle and how the valleys were carved out. If I were to write a lesson plan about the activities of the day I would be running into several pages of learning outcomes, including the numeracy outcomes involving shapes and sizes and the physical benefits of running and playing outside. Whether little ones are in school or following the home education path, this type of activity is something which is accessible for every family. It's incredibly cheap - the buckets were left over from buying yoghurt in a far cheaper way than as individual pots and an old tea strainer or sieve are a good stand in for a net if you don't have one. Most of the activities require no equipment at all (just maybe a notepad to write down anything you couldn't answer at the time to look up later - despite a Biology degree, years of teaching outdoors and in a classroom and being well into a Geosciences degree I still get plenty of questions I have to look up at home, even if it's just because it's easier to find a video of rubber being tapped from a tree than to explain it). The only thing you need is to really look, listen and experience things yourself so you can draw your kids attention to interesting things, and respond to them when they bring you things to look at. You are a brilliant teacher and your kids love it.